Last week, we were invited to check out a place called The Artisan Exchange in West Chester, PA, which is a place where people starting small artisanal businesses can gain access to a commercial kitchen and other equipment necessary for them to get started, and also a place for them to sell their products to customers at a weekly market. Vegan Cookies from Love Chunk- I am all about the chunkiness of a cookie. Give me a thin, crispy cookie and I will eat it, but I won’t be happy. These hefty cookies are almost as thick as they are wide, and they definitely don’t taste vegan. The chocolate-dipped pistachio cookie is my favorite, featuring a delicious salty-sweet flavor from the whole roasted pistachios scattered throughout and dipped in dark chocolate. Dumplings from Rebecca’s Dumplings- These dumplings are soft and juicy, just like you want them to be. 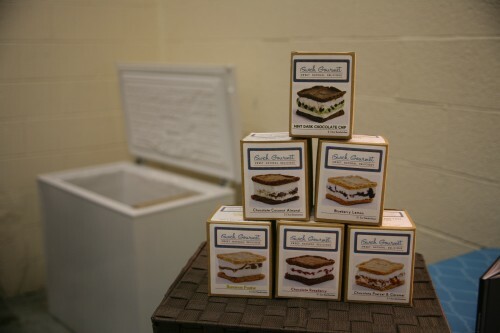 Ice Cream Sandwiches from iSwitch Gourmet- These delicious little ice cream sandwiches are available in Gourmet Grocer’s freezer case and come in adorable little cube-shaped packages! Try the bananas foster: vanilla ice cream with a layer of caramelized bananas in between and sandwiched by two blondie cookies. Granola from Earthy Crunchy Granola– This granola is seriously delicious, clumpy and not too sweet. My favorite flavor is the lemon mulberry, which has such a punchy lemon flavor that it almost tastes like the crust of a lemon curd pie! Pickles from Artisan Provisions- These pickles are wonderfully bright in flavor and have a clean crunch. 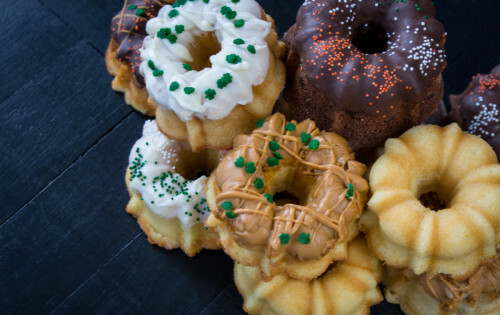 Irish Victory Cakes from MacDougall’s- These cakes are like the best pound cake you’ve ever had. They are soft, moist, and taste of butter. They are topped with a light covering of colorful sprinkles and drizzled with chocolate. Gingersnaps from Chou Chou Bakery- These gingersnaps are way different from the kind you can get in large bags from the cookie aisle in the grocery store. 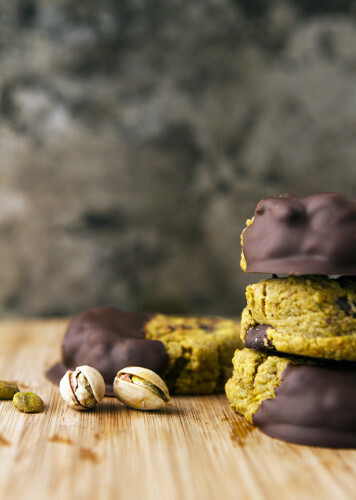 These are bright and spicy, just like you want your holiday cookies to be. Spicy Calabrian Honey from Taste Artisanal Market- Taste Artisanal Market has many varieties of honey inspired by the creator’s Calabrian roots. The most interesting of them all is the spicy honey, which is be the perfect pairing for hard cheeses. Chocolate-Stuffed Liege Waffles from Waffatopia- These waffles are different from any waffle you’ve ever had (unless you’ve been to Belgium). 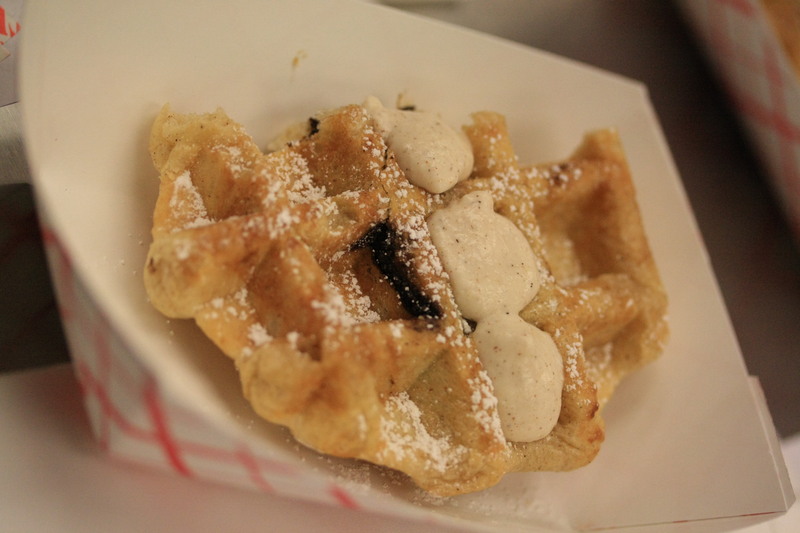 What distinguishes Liege waffles from regular waffles is that Liege waffles are made from a yeasted dough and are studded with Belgian pearl sugar, giving the waffle a sweet crunch. I highly recommend the chocolate-stuffed one, which oozes chocolate when you bite into it. 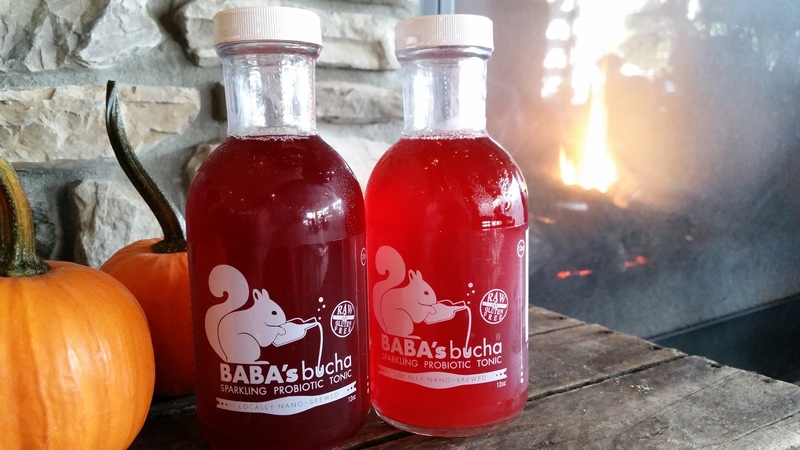 Kombucha from Baba’s Brew- I had never had kombucha (a fermented tea) before trying Babasbucha, but I really enjoyed the fizzy sourness of the drink and the clean fruity flavors that shine through. The Artisan Exchange is located in West Chester, PA.